The violin is an instrument that has four strings and can be played with a bow (\"bowing\") or by plucking the strings (\"pizzicato\"). Although becoming a great violinist takes years of extensive practice, almost anyone (including children) can learn the basics fairly quickly. Learning to play the violin involves a combination of becoming familiar with the notes involved, as well as the physical techniques used during play. Place the neck of the violin in your non-dominant hand. Lift your violin and rest it on your shoulder that corresponds with your non-dominant hand. Position the instrument so that your chin can comfortably rest on the chin rest without you having to strain your neck to do so. Pluck the first string of the violin in order to hear a G note; this is the string located farthest to the left. Pluck the second string, which is a D note. Then pluck the third string (A note) and the fourth string (E note). Pick up the bow in your dominant hand with your fingers curving over the top of the bow near the bass and your thumb on the underside right beneath your middle finger. Your grip should be firm enough to keep the bow from wobbling, but you shouldn't squeeze the bow. Place the bottom of the bow on the strings and pull the bow downward with gentle, steady pressure. Also try an upstroke by gently running the bow back upward across the strings. The more firmly you press, the louder the sound will be. Place the fingers of your non-dominant hand on first string (G) of the violin. Press down your index finger only and lift the other fingers. Draw the bow across the strings to hear a G# (also called Ab) note. Press down only your third finger for an A note, your fourth finger for an A# (Bb), and then only your fifth finger for a B note. 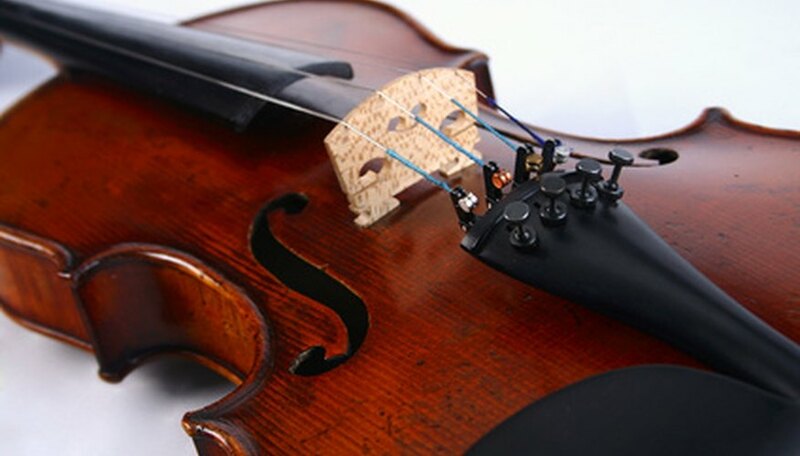 Each time you hold any string down, the pitches will become higher the closer you get toward the body of the violin. The pitches of the musical alphabet are A#(Bb), B, C, C#(Db), D, D#(Eb), E, F, F#(Gb), G, G#(Ab).